Your Girl Pho, the sassy and fun stage persona of Phoebe Gunson, known for her big vocal range, high energy and her looping during shows, she’s going to take you on a journey of relationship angst and falling in love. With a tight 3-piece band (Drums and Saxophone) she commands the room. Her recent colabs include “Calling” with Ukiyo which clocked up over 3million streams on Spotify and over 500k views on Youtube, and “Stop By” with Mexico City duo Tayrell which saw her tour Mexico in April of 2018 performing on the main stage at Festival Vaiven along with a string of headline shows. 2018 saw Your Girl Pho racking up spots on acclaimed festivals including Falls Festival, Groovin The Moo, Festival Vaiven (Mexico), Listen Out and in 2019 she will kick off the year with a spot on FOMO Festival. For Your Girl Pho’s debut National Australian single tour for “Feelen”, she played to packed out rooms across the country and in September of 2019 released her sophomore single “I Can’t Take It” which was celebrated with another tour incorporating dates across Australia and appearances at the prestigious Music Matters Conference in Singapore. 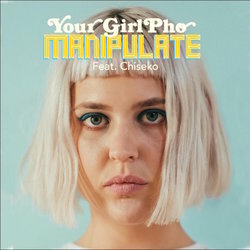 Manipulate is a reimagining of a song Your Girl Pho wrote with collaborator JCAL during her time in their project together Phocal.